Committee hearings on Bill 148, The Fair Workplaces, Better Jobs Act, are taking place this week. Today is the last chance for workers to have our say about Bill 148. We are pushing to make sure Bill 148 is as strong as it can be! While the Workers’ Action Centre and our allies work to raise the floor of working conditions, the OEERC is working to raise the funds that help fuel our leadership education programs. The 6th annual Workers’ Bowl is less than 48 hours away! We want to share another story about a WAC member who shows strong leadership by passing on workers’ rights information, supporting workers in precarious jobs, and organizing to improve working conditions in this province. Click here to share this image on Facebook. | Click here to share this image on Twitter. David, a Senior Leader since 2016, continues to make a huge impact in his work with the Centre. He is a tireless community organizer, and plays a key role in supporting and increasing the number of Tamil speaking WAC members. His outreach focuses on the Tamil community in Scarborough, but reaches far beyond. Besides facilitating workers’ rights workshops at various community centres, David uses the media to spread the message of decent work as widely as possible. Twice he has appeared on Tamil One TV, and has been interviewed on a radio show. He is seasoned at representing workers in precarious work situations and promoting labour law improvements. So far, six of David’s articles have been printed in local Tamil publications. At first, these local papers were reluctant to publish information about decent work. 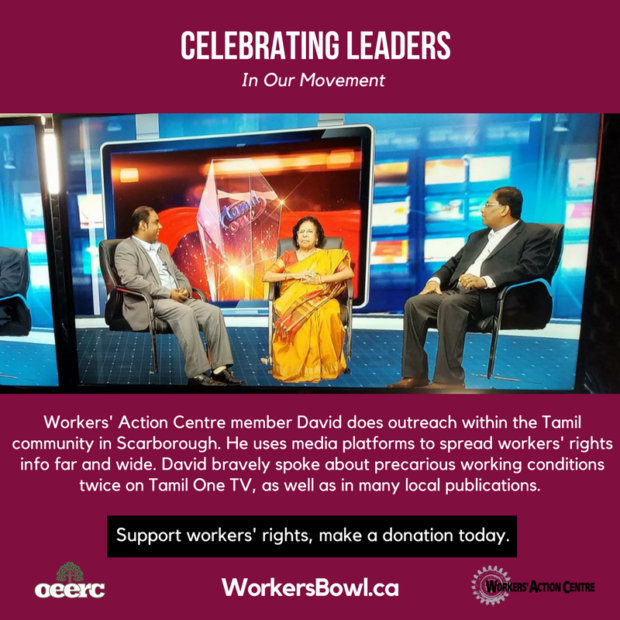 Now, because of David’s relationship building skills, they understand the importance of improving work conditions for the Tamil community and welcome his articles. Through the WAC members’ newsletter, he also updates members in Tamil and English on how they can take part in outreach events. Along with community outreach, he also raises awareness with government representatives on issues facing workers in low waged precarious jobs. WAC’s leadership education supports leaders like David in empowering more workers who are facing workplace violations. You are invited to take part in this process of empowerment. Please consider making a donation today, and also share David’s story with your networks. (Tax receipts are available for donations of $10.00 or more.) Workers’ rights and leadership education has supported hundreds of workers each year, and can continue to help even more.